Makeup wipes and facial cloths are a pretty convenient way to remove makeup. 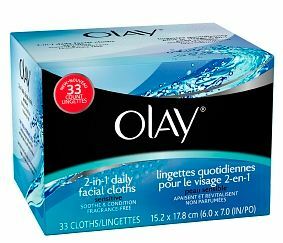 The latest we tried is Olay’s 2-in-1 Daily Facial Cloths for sensitive skin. The textured cloths are excellent for gentle exfoliation and removing makeup. You don’t have to make a lot of swipes to remove multiple layers of eyeshadow, eyeliner, and mascara. The only drawback that we found with this cloth is that although it’s for sensitive skin, it still stings if you get it in your eyes, so be careful! It’s always neat when a store brand comes out with something great. We are big fans of cleansing cloths here, our favorite being Neutrogena Makeup Remover Cleansing Towelettes. They save your washcloths/electronic cleanser from your makeup and come in handy when you don’t have the energy to wash your face at night. However, if you are reluctant to buy more than one cleanser for your face, we recommend CVS’s Dual-Sided Facial Cleansing Pads. These are made to work in conjunction with whatever facial cleanser you choose. We really liked using it with Burt’s Bees Sensitive Cleanser – since it’s so gentle you need to buy separate product if you want to exfoliate. However with the CVS cleansing pads you don’t have to. 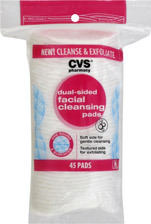 Admittedly, it’s more affordable to buy the cleansing pads than cleansing towelettes; they are only $3.29 on the CVS website for 45 pads. We loved the texture of our skin after using the pads and felt like we got a better clean than the old-fashioned way. This is especially useful for those who have combination skin; you can use the textured size to get rid of dry skin spots without exfoliating your whole face. To see more of our reviews on facial cleansers, click here. We have a new favorite cleansing towelette brand! 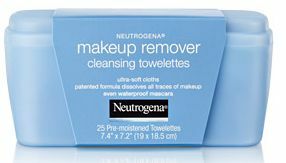 After seeing Neutrogena’s Makeup Remover Cleansing Towelettes in Allure magazine, we decided to give them a try. These towelettes truly remove ALL of your makeup effortlessly. You don’t have to make several passes to get everything off. This is not only great for when you’re too lazy to wash your face at night, it’s also great from saving your washcloths from heavy eye makeup. 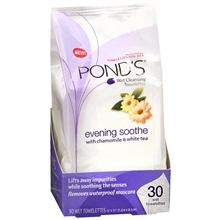 These cloths are soft and gentle on your skin and are actually a bit larger than Ponds Cleansing Towelettes. What we liked about Neutrogena over Ponds is that with Neutrogena there isn’t so much of a residue, so you can go without rinsing.